I am fortunate to work in a school where creativity is encouraged and we try to stay as far away from textbooks as possible. 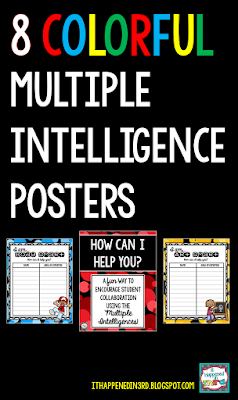 One of the things we do schoolwide is incorporate the multiple intelligences into our lessons. By doing this all students are celebrated for their strengths, and we encourage them to work on building up all the different types of intelligences through a variety of activities. I don't know about you, but I have my students working together as much as possible! I want to do what I can to break them of the habit of being "passive" learners (A habit that can begin early and stick quite quickly). Students catch on quick that in my room they are in charge of their own learning, and that working hard and taking the time to figure something out is celebrated more than having a shiny "100" at the top of their papers. Once the students complete the surveys and determine their strongest SMART, they can add their name to the appropriate poster. They can also add an area of expertise. For example, John and Suzy may both be Art Smart, but John is an expert at anime drawings and Suzy loves to draw horses. We are always working on some type of project in my room. Sometimes a kid will come up to me and say something like, "I want to make up a song to show what I learned, but I don't know how to make a beat for it." Now, instead of me helping them (and I am certainly NOT Music Smart!) or the student giving up on the project, he or she can go to the Music Smart poster and see who our musical experts are. These students can provide assistance to our friend who is stuck! At the beginning of the year it's important to spend a lot of time going over expectations for group work, cooperative learning, and collaboration. One of the things I stress is that you must help your classmate if you are asked. In addition, we have a talk about the difference between "helping" and "cheating." I want Mike to show Dan *how* to draw an awesome tiger, not draw it for him! Having the students devote time to teaching others is so important and really helps develop their verbal communication skills. We've all heard the quote "Tell me and I forget, teach me and I remember, involve me and I learn" applied to our teaching practice but it's an important thing for the students to understand as well. Most students naturally love to teach each other, and all students are more engaged when they are working on something together rather than just listening to me go on and on! In addition, I can't be an expert on everything but I can rely on my team of "experts" in the room. I know I've had students in the past who could run circles around me with PowerPoint, and even taught me some cool tricks to add to our end-of-year slide show. What a source of pride for students to look at projects around the room and think, "I helped make it better." 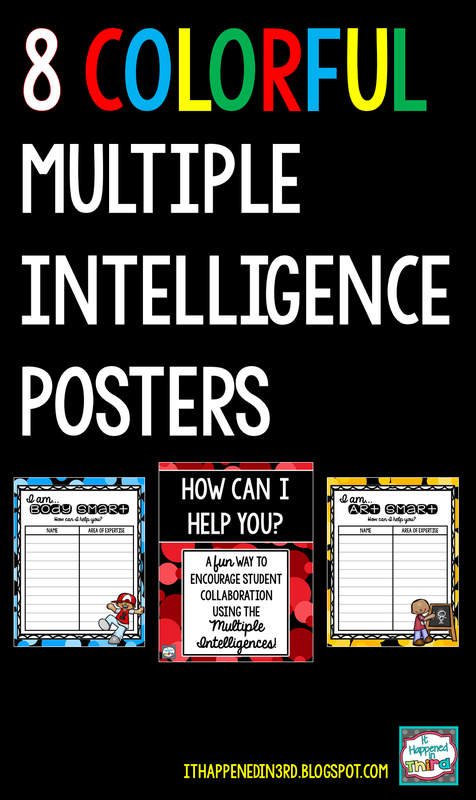 Do you incorporate the multiple intelligences in your room? What kind of collaborative activities do you use? Love this idea!! What a great way to highlight your students' skills and make them feel valuable in the classroom! Thank you for sharing!! This is a great way to highlight kid's "funds of knowledge"!